We offer fresh, all natural string cheese in a variety of sizes and flavors. 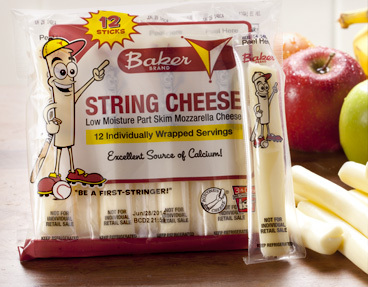 Enjoy our regular, light or smoked mozzarella string cheese. Try some today and you'll taste the freshness. The Original String Cheese is still, all-natural, made from freshest local milk, and oh by the way, took the gold medal at the 2015 World Championship Cheese Contest. So, clearly it’s awesome! Looking to cut a few calories and fat without sacrificing taste? 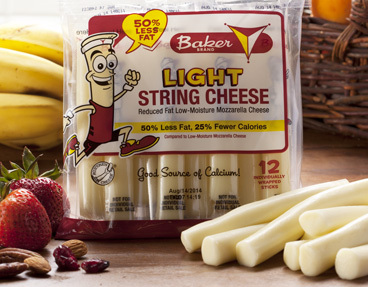 Our Light String Cheese is the answer with only 50 calories and 50% less fat than traditional string cheese. Your taste buds and your waistline will thank us! 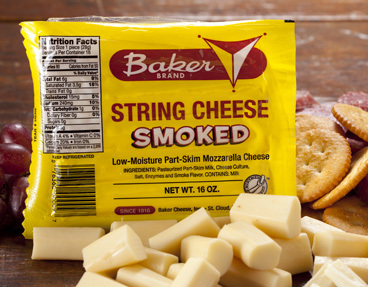 Combine the original Baker String Cheese with the original Baker smoked flavor and you can taste why our customers have enjoyed this specialty string cheese for over 30 years! Order fresh string cheese from our country cheese store. Gift boxes are also available. Our team of experts are dedicated to producing the highest quality string cheese.